“Hats Off to the Horses” has kicked off the New Year in style with a fourth hat up for bid that honors Ohio-bred millionaire and 3-time Ohio Horse of the Year, Catlaunch. 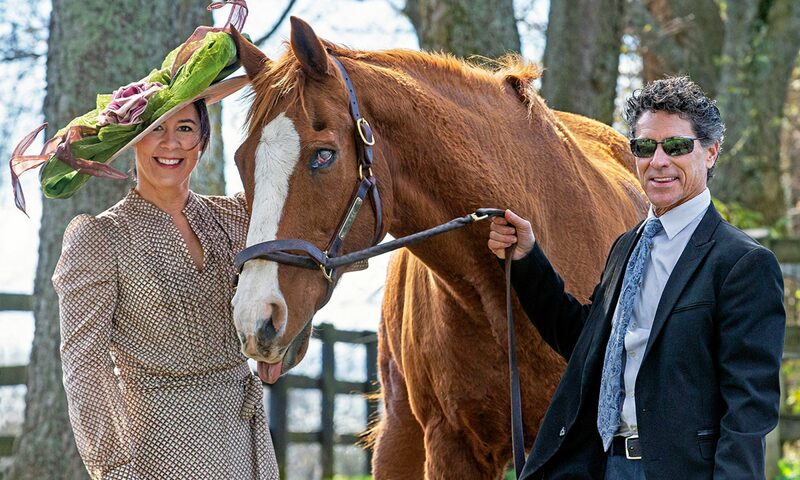 “Hats Off” is an annual Derby hat fundraiser that features six one-of-a-kind couture Derby hats created by MAGGIE MAE DESIGNS® to benefit the retired racehorses of Old Friends Thoroughbred Retirement in Kentucky. We have been delighted this season to have jockey Julien Leparoux and his wife Shea join our “Hats Off” team to model hats for us as we continue with this year’s auction theme, “Rosie Napravnik and Friends”. Shea modeled the “Clever Allemont” chapeau in November, and this month she models the spectacular “Catlaunch” top hat. To read about this month’s auction, please visit the Catlaunch hat webpage. Julien Leparoux is one of horse racing’s leading riders who earned the 2006 Eclipse Award for Outstanding Apprentice Jockey. In 2009, Julien became only the second jockey in history to win three Breeders’ Cup races during a single year. Shea, the daughter of West Coast trainer Mike Mitchel, has spent her entire life around horses and the race track. A professional singer, she loves musical theater and has worked as an entertainer at Disneyland. I recently got the chance to interview Shea and Julien following their photo shoot at Old Friends for the “Catlaunch” chapeau. Sally Faith Steinmann: Shea and Julien, welcome to my Hats and Horses blog. For those who are meeting you two here for the first time, where were you born and where did you grow up? What are your earliest memories of horses? Julien Leparoux : I was born in Senlis, France and grew up in Chantilly. I grew up riding and competed in show jumping by the age of 11. Shea Leparoux: I am a southern California native, born in Arcadia at the hospital next to Santa Anita. I grew up watching my older sister compete in show jumping. Sally: Julien, I read that your dad was a jockey and a trainer. When did you first realize that you wanted to be a jockey? Was there anyone who especially inspired or helped you along the way? Julien: My dad was a jockey for a short time and an assistant trainer for many years. I had the horse racing bug early on. Jockey might have been my first words as a toddler. I always knew I wanted to be a jockey. But my father wouldn’t let me pursue riding races until I finished school. Sally: Julien, I understand that you moved to the U.S. from France in 2003, worked as an exercise rider for Patrick Biancone and then had an amazing breakout season as a jockey in 2006. What goals or dreams do you have for the future? Julien: Working for Patrick Biancone was a great stepping stool for my career, he believed in me and gave me many opportunities. One of my goals is to win the Kentucky Derby. Sally: Julien, being a jockey means early mornings and a lot of travel; what would be the perfect day to you? Julien: The perfect day for me would be relaxing at home, watching Paris St. Germain play a game, with my Italian Greyhound, Mozart. Shea: Our dog Mozart is 7 years old. He’s one of the coolest dogs. He travels better than most people. He also understands French and English. Sally: Shea, you’ve had a long history with horses as well. Your dad is a West Coast trainer and it sounds like you’ve spent pretty much your whole life around horses and the track. Were you ever involved in your Dad’s training work? Shea: I grew up in the horse racing world as well. I spent lots of mornings at Hollywood Park where my dad stabled for many years. My father, Mike Mitchell, loved having his daughters at the track, but did not want us to partake in it as a career. He even went as far to make a rule that we were not allowed to date jockeys. Sally: I understand that you two recently celebrated your second wedding anniversary. I have to ask you, Shea, if your Dad didn’t want you to date jockeys, how did you and Julien ever meet? Shea: Yes, we just celebrated our second anniversary. We met at a Kentucky Derby a while back. Julien also rode horses for my dad before we ever met. We reconnected, over strange circumstances, when my whole family went to Keeneland. Julien, unfortunately, took a spill at the track. When I found out who the jockey was I sent him a message on social media to make sure he was ok. With that, he immediately responded, and the rest was history. We now live in Kentucky, Florida, and Saratoga throughout the year. Sally: I loved the Thoroughbred Aftercare Alliance’s new promotional video “All About the Horse” in which you do the voice. Tell us about that experience. Shea: Being apart of the Aftercare Alliance video was fun for me. I was glad I could help out for a good cause. When singing and horse racing combine its a perfect exacta for me. Sally: Shea, I remember that you sang the National Anthem on a recent Breeders’ Cup weekend and that you have enjoyed a singing career as an entertainer at Disneyland. What was your musical training growing up? Shea: I never stopped singing as kid. I was in a choir for about eight years and studied with a vocal coach. I also did musical theater, my true passion. I started singing the national anthem at the races at 16. My dad took it upon himself to be my race track anthem agent. My highlights were singing at three different Breeders Cup events. It was awesome to be apart of it. I went on to study theater in college. I got my first performing job at 20. I worked at Hong Kong Disneyland, performing in a musical, as Belle. I then worked for Disney for the next eight years at Paris Disneyland, Disney Cruiseline, and Anaheim Disney. Sally: I understand that your recent photo shoot at Old Friends for our “Hats Off to the Horses” Derby hat fundraiser wasn’t your first visit to Dream Chase Farm. Can you tell me a little bit about your trip to Old Friends back in April 2012 to visit Ball Four? Julien: Yes, we visited Old Friends back in 2012 It was Shea’s first time. Visiting Ball Four was the highlight. He was the first horse I ever rode in a race. It was great to see him enjoying retirement at a place that truly cares about the animals. The only thing different about him was his grown out coat and long mane. He was still full of life and tried to take a bite out of me a couple times. Sally: Our next hat up on the block for the January auction is the “Catlaunch” chapeau which was one of the hats, Shea, that you modeled at Old Friends. How did the photo shoot go? Shea: The photo shoot with Catlaunch was fun. He was pretty fresh that day like he wanted to break out of the gate. Julien did a good job of keeping him calm. The best part was when someone played barn animal sounds from an iPhone to get him to perk up and pose. The trick worked! Sally: And did you get a chance to meet Little Silver Charm, spokeshorse extraordinaire for Old Friends, while you were there at Dream Chase farm? Shea: Little Silver Charm is pretty cute, greeting you when you arrive at the farm, he’s a great spokeshorse. Sally: I am sure that people are going to be inspired by your support of Old Friends. Why is it important for us to support these retired Thoroughbred athletes, and do you have any suggestions for how people can get involved and participate in helping the retired racehorses? Julien and Shea: After seeing first hand the great things that Old Friends does for retired race horses we have tried to help in any way we can. These amazing animals are our livelihood and we owe it to them to take care of them when they are done racing. People can get involved with Old Friends by participating in their fundraisers throughout the year. Another way of participating is through the Hats Off to the Horses auction that we are a part of along with Rosie and her husband Joe. If you take the time to visit the farm in Kentucky or Saratoga, go on the tour of the facility and you’ll see how much they care for these retired stars. Sally: Shea and Julien, thanks again for helping us with our Sixth Annual “Hats Off to the Horses” auction series with the “Catlaunch” chapeau. We are really fortunate to have you on board as part of our “Hats Off” team! Please enjoy this “behind-the-scenes” video from the “Catlaunch” photo shoot with Shea and Julien at Old Friends, a special treat from our friends Matt and Wendy Wooley of EquiSport Photos! ‘Til next time, thanks for visiting me at Hats and Horses!